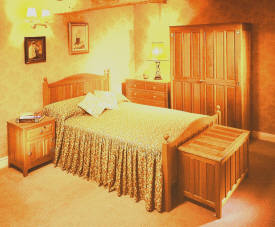 Old Mill Furniture was established in 1984, producing handmade traditional oak dining and bedroom furniture for the home, plus office desks, bookcases and other bespoke pieces We are a family business Adrian, Jeremy, and Horace Knight. 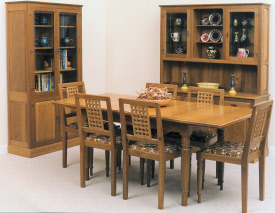 We have a great team of craftsmen and now produce handmade furniture, in Oak, Walnut, Maple, Mahogany, Cherry, Elm, Ash and Beech in traditional, timeless and modern styles. A unique feature of what we do is that every piece is made by an individual craftsman, from choosing the wood right through to final finishing. 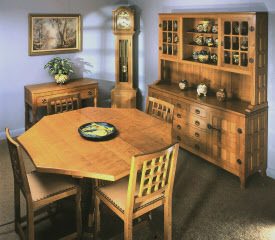 The result is furniture that will be a pleasure to own, and will last for generations. We have a wide range of standard designs to choose from or we can make special pieces for your home or office. 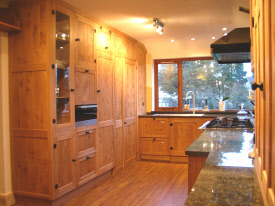 We also make Kitchens, fitted or unfitted, natural wood or hand painted. See some of what we do on the following pages. Trees are a renewable, usable resource making solid wood furniture a pleasure to own and use knowing that its construction has caused minimum damage to our natural world. We buy timber from reputable merchants who supply us with plantation grown timber, or timber from areas following schemes for reafforestation. We endeavour to create a safe environment in our workshops for our craftsmen and prevent pollution by following a sensible waste disposal system. In this way we minimise the impact of our business on the environment whilst retaining product performance, quality and safety.